Antonello’s painting is exquisitely detailed – probably showing the influence of such Netherlandish painters as Jan van Eyck – and draws us into a moment of warmth and calm in the life of the saint. The scene of the scholar seated at a desk is framed by a stone window frame which glows as if lit by bright sunlight. The shiny copper bowl in the bottom right hand corner of the window reflects this light, and is one of the very few reflective metallic surfaces in the painting – a feature which attracts the eye to a seemingly insignificant object. 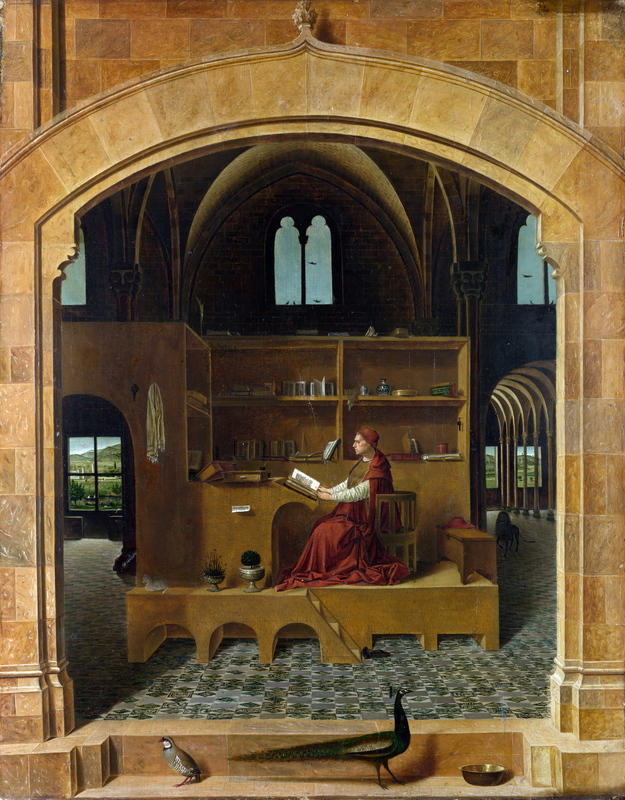 The dominant colours are warm and naturalistic: inside Jerome’s study the wood of his desk and dais harmonizes with the bright glow of the stone window frame, the dull red of Jerome’s cardinal’s robe, and his leather-bound books. The green pattern of the tiled floor leads the eye to the back of the painting where in the far distance the outside world can be glimpsed, and the amount of yellow in the landscape warms the green hues and contributes to chromatic unity. The same unity is evident in Antonello’s use of light: the cloister in which Jerome sits is dark, apart from a triangular area of light around the saint himself. This focuses our gaze on Jerome, while emphasizing the separation of the saint from the viewer; the light that bathes Jerome is of a different and softer quality to the exterior light. The window-frame through which we view the saint shows that the reflective quality of the stone work is created by the amount of white paint in Antonello’s rendering of the stone. Antonello demonstrates his skill as a miniaturist by creating texture, although the space is limited, and the most obvious examples are the gleaming copper bowl, and the peacock’s feathers. The wood of Jerome’s dais is smooth and flat, but the towel hanging from the wall is clearly a rough cloth. The alfabeguer holding a small tree is also obvious as a glazed ceramic, and its gleam catches the eye. [iii] Where Jerome sits, the brightest areas are the saint’s white sleeves, the pages of his open books, and the small piece of paper attached to the side of his dais. The contrasting qualities of light – sunshine in our world, and filtered illumination around the saint – accentuate Jerome’s monastic separation from the world. His illumination is as much spiritual as natural and light emphasises Jerome’s isolation whilst capturing his stillness. Antonello frequently painted faces in a three-quarter view, an angle suggesting animation and movement, but he has depicted Jerome in profile which is a static position. [iv] All Jerome’s attention is on his book, and he is oblivious to the presence of another person. A close viewing suggests that the lion has been moving, but has suddenly become still. In fact it is only the lion that is aware of the viewer. Stillness is also created by a number of repeated patterns, including the tiled floor, and the recurring arched patterns made by the vaulted ceiling, the arches in the cloister on the right side of the painting, and the windows. There is little in the painting which is unexpected, and there are no elements within Jerome’s study which look ‘noisy’ or compete with Jerome for our attention. The tiny cat on the left hand side of the dais is also very still. The implied silence and Antonello’s careful arrangement of objects contribute to the painting’s contemplative atmosphere. Each article is significant: the lion is St Jerome’s symbol, after he removed a thorn from its paw; the books and items on the shelves double as symbols of Jerome’s scholarship and of the Virgin Mary. [v] Mary was particularly important to Jerome for he regarded her as the ultimate model for followers of the monastic life. The carnation plant on the left is also a Marian symbol, whilst the tree is associated with the Garden of Eden. [vi] Juxtaposing Mary’s virginity with the sin of Adam and Eve is one of the several signs of opposing good and evil in the painting. In the foreground, the peacock (immortality and incorruptibility) and partridge (a bird of supposedly evil and licentious nature) face off against each other. The cat is another ambiguous symbol: with the partridge, cats were associated with the Devil, but Trapp’s article ‘Petrarchan Places. An Essay in the Iconography of Commemoration’ links Antonello’s depiction of the cat with other precedents in images of study and authorship. [vii] The composition of the painting suggests the former interpretation. The objects associated with evil – cat and partridge – face left, towards the darker of the two corridors. At the end of this corridor is the only closed/obstructed window in the painting, and beyond the window is a scene of everyday life (perhaps symbolising Jerome’s distance from worldly things). The grubby towel hanging on the wall is another reminder of human sin, and forms a contrast with the copper bowl of clean water. Beyond the window on the right is a wilderness, to remind us of Jerome’s years as a hermit. The peacock points towards this unsullied landscape, and its purity is reinforced by the bowl of water. Meanwhile, Jerome faces the dark side of the chamber, perhaps intending to banish evil with lectio divina whilst heavenly light illuminates his book. It is clear that the assortment of objects in this painting support a very strong statement of the conflicts between the earthly and the spiritual life which preoccupied St Jerome’s scholarship. The design of Antonello’s St Jerome draws us into the painting, attracted initially by its exquisite detail and its warmth. The painting rewards close examination, as each of its elements reveals itself, enabling the viewer to develop an understanding of its allegorical significance. Even its size is important, as the small scale of the painting means that a long, detailed examination is required. These aspects draw the viewer closer still, and allow the painting to function as an object of devotion as well as an object of aesthetic significance. Antonello’s own devotion to exquisite detail and visual beauty is a metaphor for the spiritual beauty of the pure monastic life that St Jerome advocated. [i] Contemplation is especially relevant in the case of this particular study of St Jerome: the saint was one of the Four Fathers of the church. A great scholar who knew Greek and Hebrew, Jerome’s most significant achievement was producing a standardised Latin translation of the Bible, which we now know as the Vulgate.